The first major rock music festival and the precursor to Woodstock, the Monterey International Pop Festival was an unprecedented gathering of pop, soul, jazz, and folk artists who took the stage one luminous weekend during the Summer of Love.” On the 16th, 17th, and 18th of June, 1967, the sleepy California coastal community of Monterey played host to the now-legendary concert. In its aftermath, the world of popular culture was transformed forever. The ’60s were now upon us with a soundtrack, a style, and a political and social sensibility all its own. 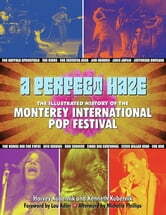 A Perfect Haze is the official history of this glorious festival. 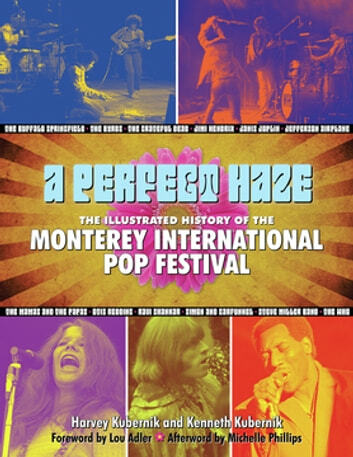 With the endorsement and support of producer Lou Adler and the Monterey International Pop Festival Foundation, the sights and sounds of the festival come to life in this extravagant compilation of photography, memorabilia, and first-hand accounts by musicians, fans, crew members, and others who attended the concert. To read its pages is to step back in time to the moment of rock’s big bang, when Jimi Hendrix, the Who, Otis Redding, Ravi Shankar, Janis Joplin, the Grateful Dead, Jefferson Airplane, the Byrds, Buffalo Springfield, and dozens more set the stage on fire-both metaphorically and, in one iconic instance, literally! A Perfect Haze is packed with hundreds of photographs taken both in front of the stage and behind the scenes, including works by such notable artists as Henry Diltz, Elaine Mayes, and Nurit Wilde. Festival programs, posters, advertisements, album covers, and other ephemera-most of which has never been seen before-are also included, provided by Lou Adler, the festival’s nonprofit foundation, collectors, participants, and fans who attended the event.